Yesterday, I went for a bike ride with my hubby on our new beach cruisers and as we rode through our little beach neighborhood. I was so inspired by the colorful beach houses, palm trees and the gorgeous sky. In the midst of enjoying the views on our ride, I was able to brainstorm a bit about Seaside Invitations and the direction I want to take it in. The thoughts & ideas were just pouring into my head, there is so much that I want to do with my company, so many directions. Ideas like personalized stationery and postcards, address labels, more customized maps, hand painted invitations, family trees, and so much more... Oh will I ever get it all out on paper. Since starting Seaside, my eyes have been retrained to see things in a new light. I notice colors so much more now; I see signs and automatically notice the graphics and fonts and I think how can I transform that into a beautiful invitation. I've been thinking about designing personal stationery for some time now. I have been jotting down ideas here and there but our bike ride inspired me to place some designs. 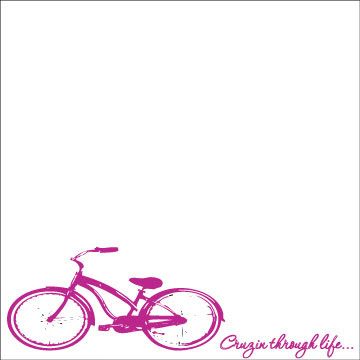 Here is my first piece of stationery inspired by my beach cruiser and bike ride. I decided to go away from the traditional note card stationary, and design it as a postcard. Postcards allow just enough room to send a loved one a special note, while keeping your postage cost low. Never underestimate the power of a hand written note. Even a "hello, I am thinking of you" can be a pretty powerful heart warmer. 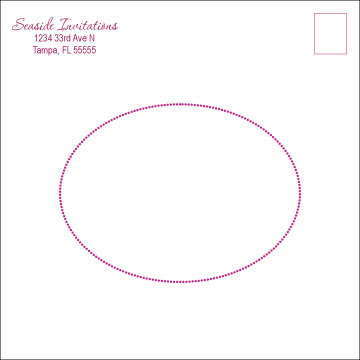 To place an order for your very own customized personal stationery, contact me at alicia@seasideinvitations.com. Check back to see the rest of my postcard stationery collection.